In his role as an undercover investigator for the British Horseracing Authority, Jeff Hinkley is approached by a multi-time champion jockey to discuss the delicate matter of losing races on purpose. Little does he know that the call will set off a lethal chain of events, including the apparent suicide of the jockey and an attempt on Hinkley’s own life. Never one to leave suspicious events alone, Hinkley begins investigating the jockey and the races he may have thrown. But there are others out there who intend to prevent his inquiry from probing further . . . at any cost. 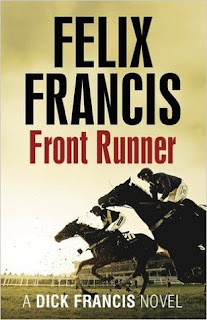 Felix Francis's second novel featuring BHA investigator Jeff Hinkley fair tears out of the gate, gallops along at high pace, and doesn't let up until it passes the finishing post. The sequel to DAMAGE and fore-runner to the US-set TRIPLE CROWN, it could be read as a standalone and you don't need to have read the prior Hinkley tale to get the most out of this one. There's plenty enough salted in to give you a sense of the main character and something of his history before the first page. Here, Hinkley is investigating claims that a bettor may be operating on behalf of someone who has been banned from racing, but ends up looking into something far more dangerous. Britain's top steeplechase jockey, who Hinkley is on friendly terms with, intimates to Hinkley that he did less than his best in a recent race, before clamming up. As Hinkley tries to find out more, without immediately reporting the jockey, everything goes wrong. He's locked in the jockey's sauna and left to die, and even after breaking out, later discovers that the jockey has been found dead in his car. A suicide because of his guilt? Or is more involved. This is a really fun, easy read that fair tears along. Francis has an unobtrusive writing style that flows quickly, filled with plenty of action and incident to keep the pages whirring. Hinkley is an engaging hero, likable and interesting. Some of the other characters feel a little more like moving parts. There's a lot going on plotwise, and readers get a bit of an adventurous treat when Hinkley ends up leaving the mud and thundering hooves of the British racecourses to vacation in the Cayman Islands. Of course trouble is not far away. A fun, exciting read that shows Felix Francis is more than just a foal with good bloodlines. He's a storytelling thoroughbred in his own right.